Lake Minnetonka Association: What Next? Now that zebra mussels are in Lake Minnetonka to stay, we will have to learn to cope with their impacts. We have an opportunity to learn from this and make adjustments to keep new and forthcoming other aquatic invasive species (AIS) out of Lake Minnetonka. Unfortunately, zebra mussels will not be the last AIS to threaten Lake Minnetonka. The nature of the AIS issue makes this a large challenge on many levels, but a challenge we ought to confront. The Lake Minnetonka Association has been urging protection against zebra mussel for about ten years. Perhaps by using zebra mussel as our poster AIS, we have not given enough emphasis to other AIS nearing Lake Minnetonka. We cannot afford to let down our guard because new AIS, such as hydrilla, spiny waterflea, VHS and many more, all will damage our lake should they get in. We have learned that current protections – local and statewide are not adequate. An effective AIS protection system requires both statewide and local elements. The protections now in place are largely permissive, relying on public awareness and voluntary actions. There are laws, which are enforced somewhat, but not nearly enough. At the local level, there have been ramped up inspection efforts, but these too have not been sufficient. For example, the LMCD’s Strategic Plan says 19,000 inspection hours (per season) are needed. This season, there were approximately 4,000 hours of inspections. The Minnesota Department of Natural Resources is hosting a series of stakeholder meetings this Autumn and the Lake Minnetonka Association has been invited to participate. A similar series of meetings occurred last year and one outcome was the new law requiring all boats to drain their water reservoirs after leaving any lake or river. Additional steps must be taken soon and our hope is these will be embraced in the upcoming legislative session. We must recognize however, additional protection measures may be controversial or face obstacles. New funding of any kind will pose challenges in this economic climate. The Lake Minnetonka Association supports a fee system like that in place on Lake Tahoe, where boaters pay fees on two tiers – those using only Lake Tahoe and those visiting other lakes. These fees pay for inspections. For Minnesota, a version of this two-tier boat license system is being considered by the Minnehaha Creek Watershed District for possible introduction to the state legislature. Another challenge we will encounter is there are angling and boating interests who may object to the cultural changes embodied by a more comprehensive protection system. Many individuals and groups have expressed concerns regarding the increased intrusiveness of additional laws, fees or inspections. These groups will be represented in the DNR’s stakeholder meetings and we will work to reach common understandings of the AIS challenges and impacts so we can come to consensus regarding meaningful and effective protections while allowing all Minnesotans to enjoy our lakes. Given that several dozen new AIS have been identified by the DNR as having potential to impact Minnesota lakes, we must not let down our guard. 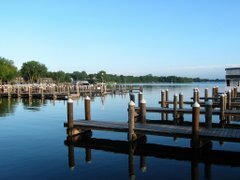 The Lake Minnetonka Association believes that if our local and state leaders can get on board with these guiding principles, then the details will follow. The Lake Minnetonka Association, partnering with Minnesota Waters and local leaders is prepared to offer specific recommendations.